Keep everything safe and secure and in one place. Ideal for garden tools, equipment and outdoor toys. Made of weatherproof, UV-resistant plastic. Dimensions: H58 x W118.9 x D45.2cm (23in x 46.8in x 18in approx.). Protect your garden equipment with this large garden storage chest. 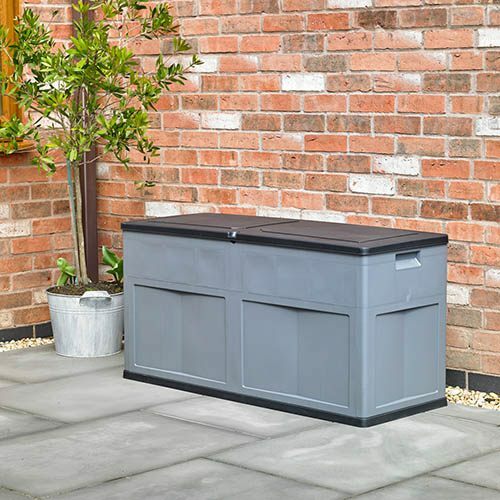 With a generous 320L capacity, this outdoor storage box is perfect for storing garden tools, toys and outdoor cushions, keeping everything safe, clean and dry all year round when not in use. Made from sturdy, weatherproof, easy-to-clean grey plastic, this storage chest features a full length, easy-open hinged lid with a padlock hole, so you can lock the items in to keep them safe and secure. Sturdy yet lightweight, its easily assembled by one person. H59cm x W119cm x D45cm (23in x 46.8in x 18in approx.). Easy Assembly, instructions included. H59cm x W119cm x D45cm (23in x 46.8in x 18in approx. ).